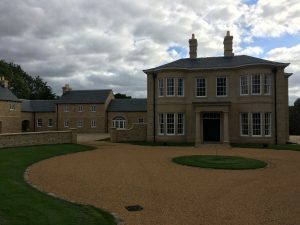 A luxurious new build mansion with associated outhouses and tennis courts on the outskirts of York. The existing buildings were demolished and a new building comprising of sandstone finish, to stay in keeping with the style of the surrounding areas, was erected in its place. The finished product was to form a new family home to a private owner. EMCE were involved from an early stage to help implement the design and build of the building services. As well as the usual M&E services you would expect within a home the house also incorporates a Ground Source Heat Pump. The project was finished to a high specification with feature lighting and decorative accessories to each room. EMCE provided design input such as boiler sizing, lighting schemes and loading calculations as well as coordinated layout drawings and as builts.